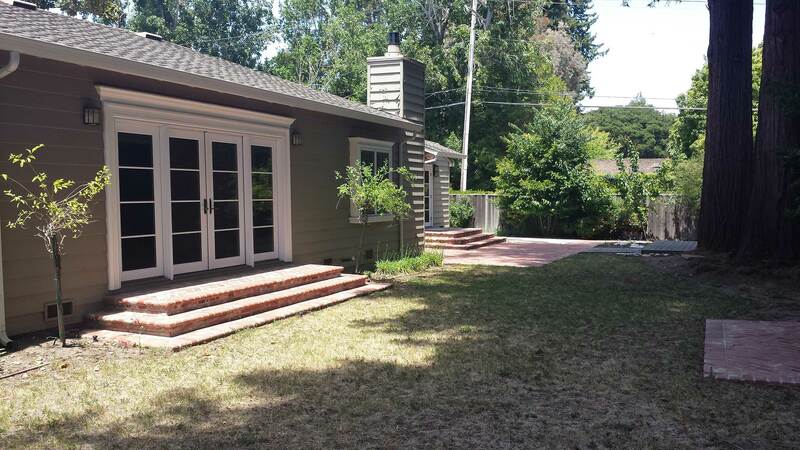 This Hillsborough Design-Build property was an exciting and challenging project. The design strived to incorporate an extensive list of programmatic elements in a relatively small space. 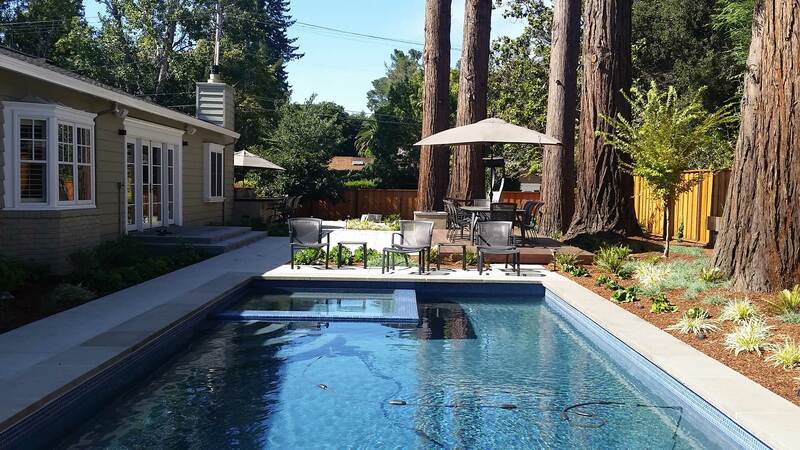 The project scope included: a pool and spa, outdoor deck for dining, fire pit under the redwood trees, outdoor kitchen, Zen garden and, a sports area. Espaliers, vegetable planters and various plantings also were featured in this project. Terra Ferma Landscapes was engaged throughout the entire project from schematic design though final installation. A key design goal was to ensure the clients and guests could see and interact with one another from the various spaces within the rear garden. This resulted with having spaces connected by clearly defined sight lines which also allowed spaces to flow into each other. Terra Ferma Landscapes collaborated closely with the Feng Shui consultants, as they reviewed and provided input of the design layout and programming to ensure the landscape scheme provided the best possible environment for health and prosperity for our clients. Combining our expertise with the Feng Shui consultant’s design principles, we were able to harmoniously blend the two approaches for a holistically designed garden. 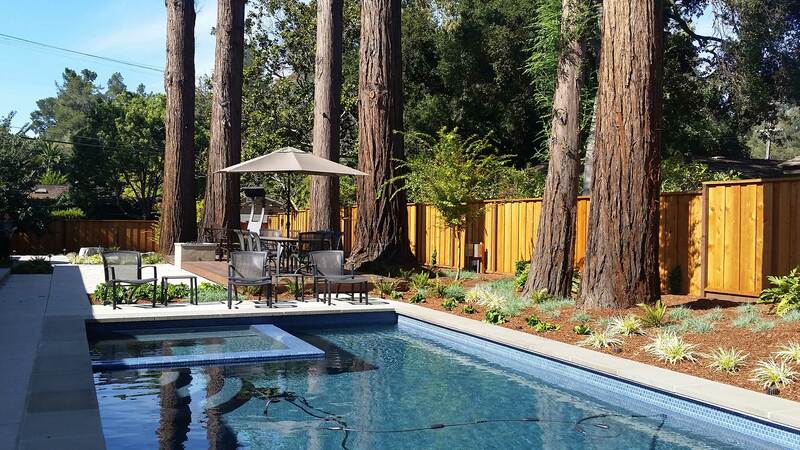 The pool, as blessed by the Feng Shui consultant, is strategically located between the house and the redwood trees. This location is auspicious and provides good ‘Chi’ for the residents. With the input of an arborist, we were able to determine the best way to build the pool next to the existing mature trees. 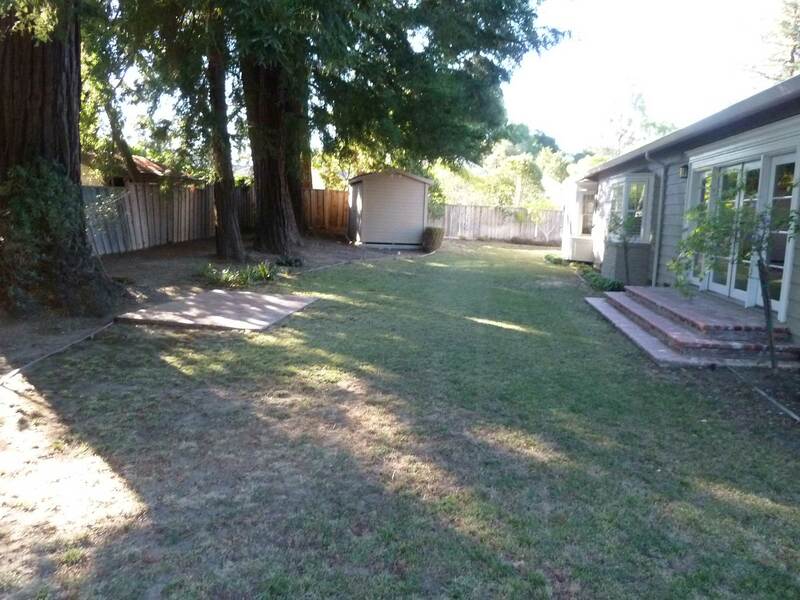 A ‘floating’ redwood deck is located in this area. 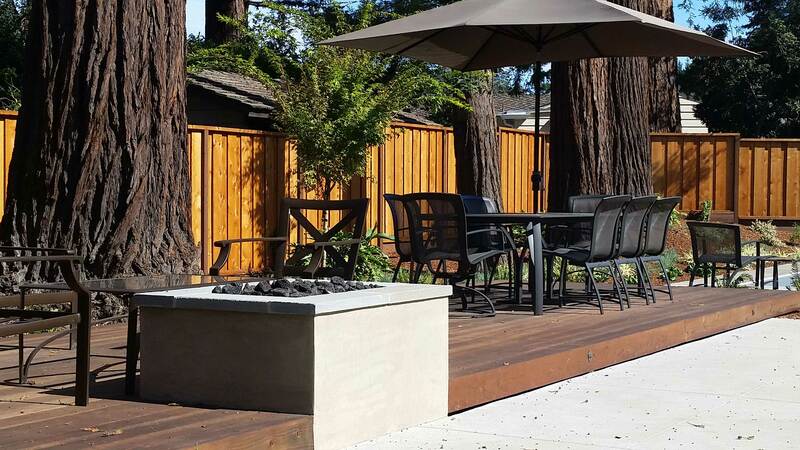 Through mindful deck construction methods, we utilized pier footings as a means of ensuring minimum impact on the root systems of the existing Redwood trees. 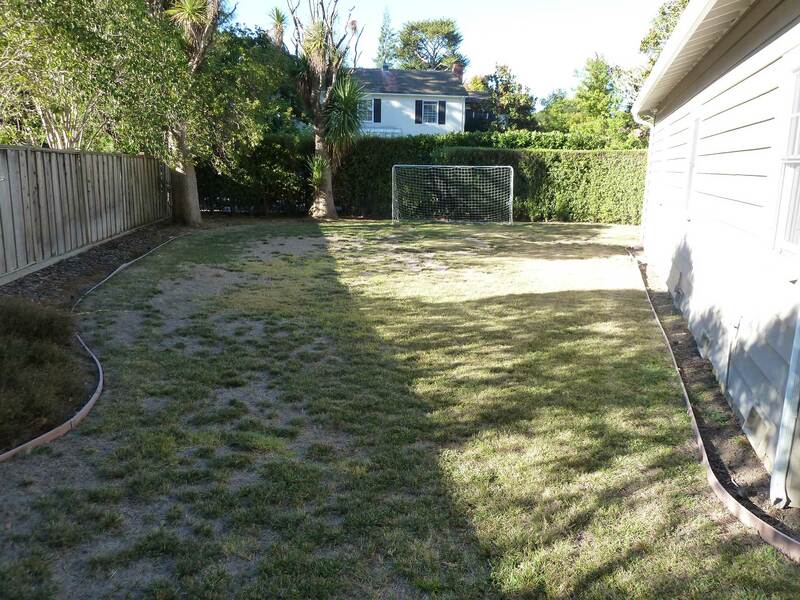 The existing conditions and construction photos below depict the transformation of this garden. 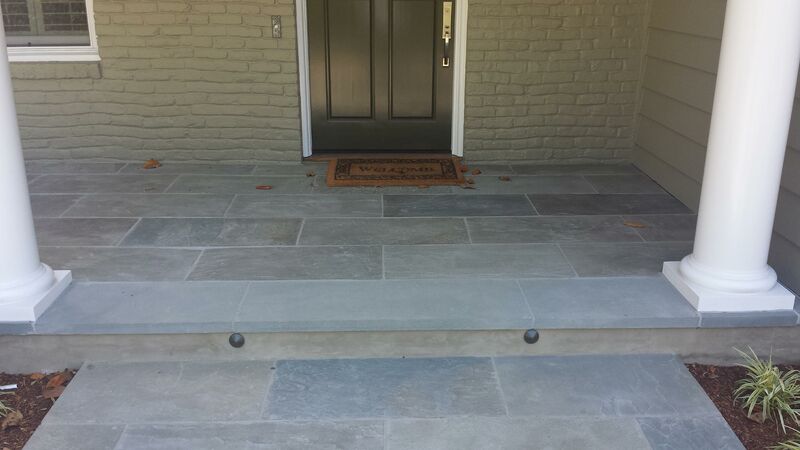 The paving materials used on the project are: select bluestone, full range bluestone, colored acid washed concrete and ornamental gravel. 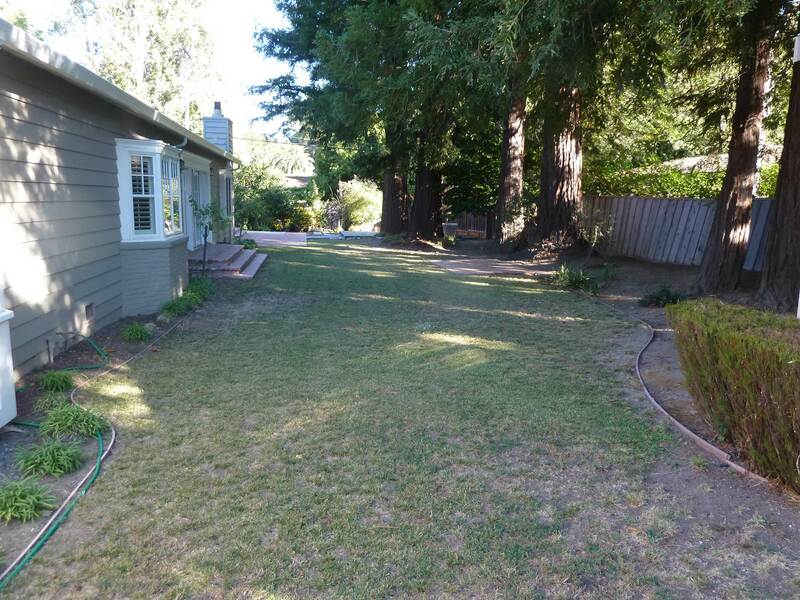 The planting design in the rear garden sought to complement the dominating forest character of the existing Redwood trees, while in the front garden planting introduced a more ornamental theme to provide a welcoming entry experience. 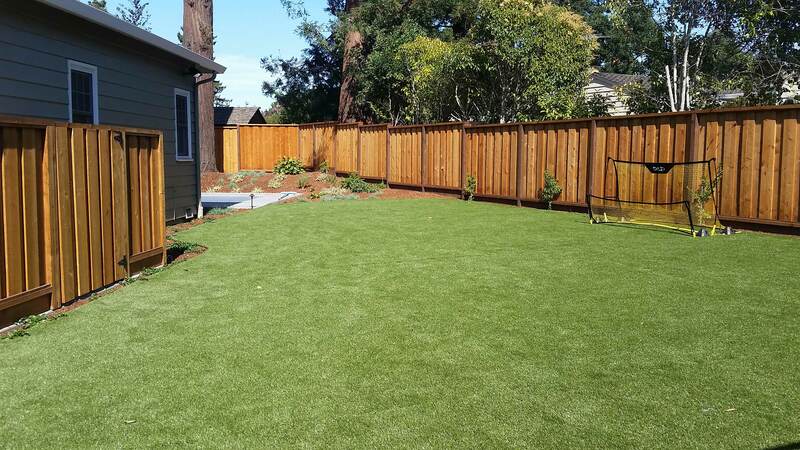 The synthetic grass sports area was the first to receive Town of Hillsborough permitting approval for a permeable synthetic lawn installation. Classified as ‘softscape’, this feature did not count towards the ‘hardscape’ calculations. We worked with Field of Green turf suppliers and installers on a permeable synthetic grass detail. This approach not only provided a durable and consistent surfaced sports area, it also greatly reduced site irrigation water usage and costs compared to natural turf. The result is a vibrant space that successfully is able to handle frequent use and at the same time looks great all year round. 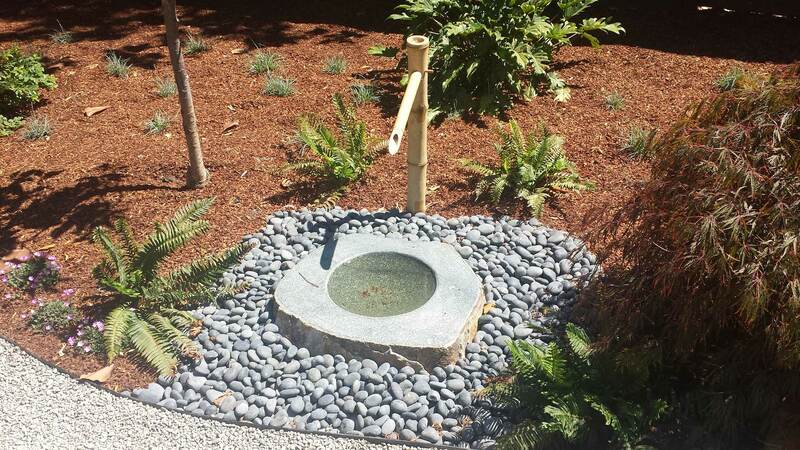 The Japanese inspired Zen garden was a feature element of this project. 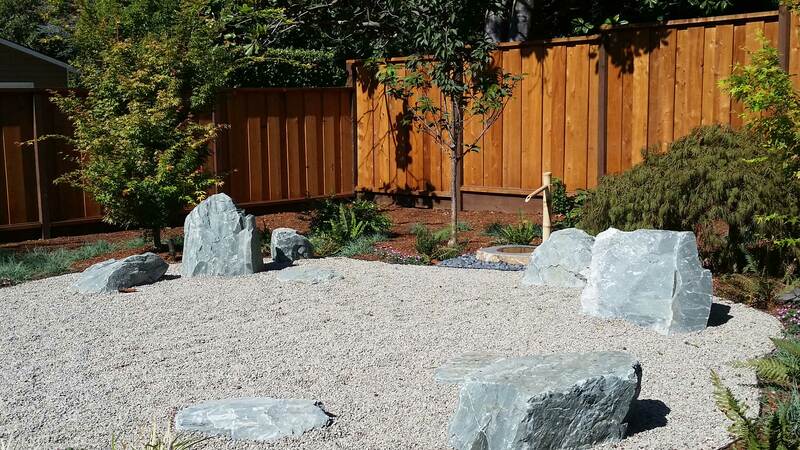 Based on traditional Japanese design techniques, this intimate garden included large boulders, a honed stone bench, fine decorative gravel, a bamboo and stone water feature created by Stone Forest and a Japanese ‘Sakura’ cherry blossom tree. We collaborated closely with the clients to develop the exact layout and design they envisioned for the space. The design process started with loose sketches to solidify a final concept. 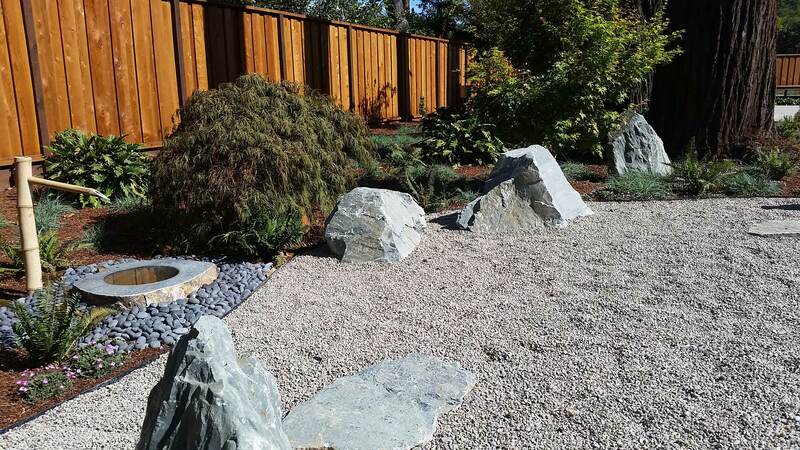 After the individual boulders and materials were selected we worked with our Client to thoughtfully locate their final placement. 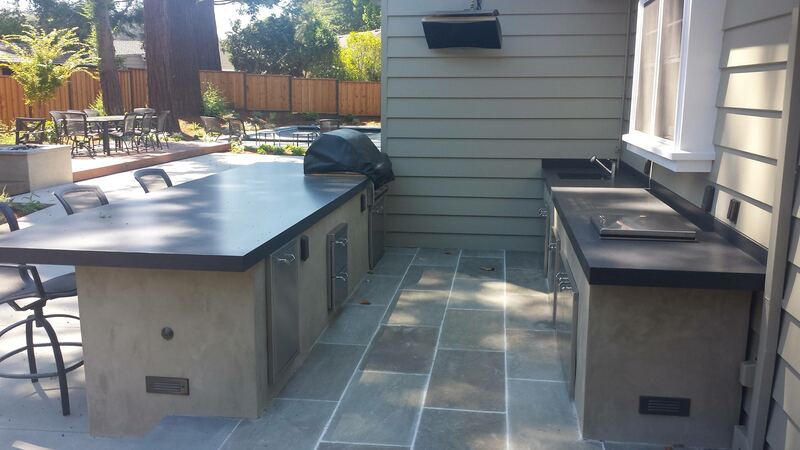 The outdoor kitchen acts as a hub to the overall design. It is conveniently located adjacent to the house kitchen and in close proximity to all other spaces within the rear garden. Our clients love entertaining, cooking and relaxing with their friends, which often revolves around cooking. This has become their favorite space. The counter is made from leathered finish black granite while the structure of the kitchen walls are stucco with integral color. A Bromic gas heater supplies heat for users. The fixtures include: stainless steel Lynx grill, cabinets, ice cooler, trash receptacle and sink. The Terra Ferma Landscapes team really enjoyed seeing all the various elements come together. We see our Clients enjoying their new garden for years to come with family and friends.